It costs nothing to ring - and if you're lucky you'll get an answer. 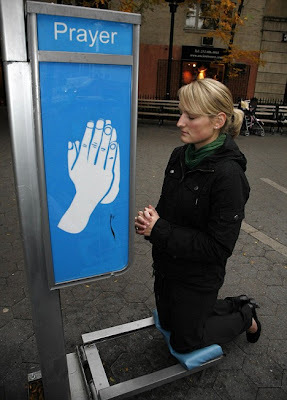 New Yorkers have a new avenue for faith - public prayer booths giving the devout a chance to make a call to the heavens to seek comfort and advice. The booth, which includes a flip-down kneeler, is an art installation designed to spark dialogue about faith in the modern world. Designer Dylan Mortimer installed the booth at Tramway Plaza, New York, to explore the question of how private faith functions in the public realm. He said: 'My goal is to spark dialogue about a topic often avoided, and often treated cynically by the contemporary art world. Passers-by have enjoyed the installation, either by taking a moment to engage with God, or simply being amused by the spectacle. Dylan added: 'I employ the visual language of signage and public information systems, using them as a contemporary form of older religious communication systems such as stained glass and illuminated manuscripts. The Kansas-city based artist is a recent graduate of New York’s School of Visual Arts Masters (MFA) programme.